Forget Google Glass; the tech giant is in the footwear business now. Or at least it was at the SXSW series of film, interactive, and music festivals in Austin on Monday. Together with Adidas, the technology giant unveiled its concept “Talking Shoe,” a smart sneaker designed to get people off the couch and exercising. But Google didn’t just see fit to give the shoe the usual moving parts (an accelerometer, a gyroscope, a pressure sensor, Bluetooth connectivity). The sneaker also boasts a personality, one that is alternatively cheering and jeering depending on your level of activity. The Talking Shoe has an arsenal of 250 quippy phrases it can dish out like a snarky personal trainer or drill sergeant. Raise your heart rate even further and the shoe will respond with even more praise-filled exclamations: “Call 911, you’re on fire,” “You have made me a very proud shoe,” or “Wait till I tell my friends about this.” For an extra layer of motivation, you can also publish your activity on your various social networks. Don’t expect Google to roll out the sneaker any time soon, though. 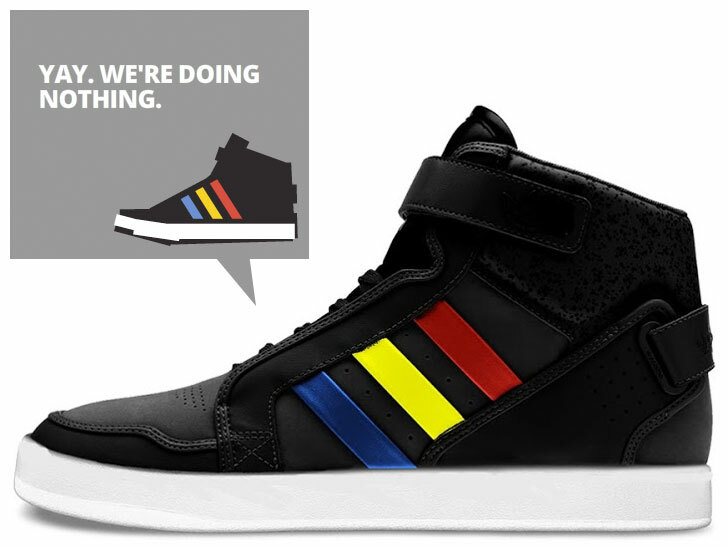 The company commissioned artist-hacker Zach Lieberman and interactive collective YesYesNo to create the shoe as part of its “Art Copy & Code” series of experiments in online branding. More specifically, it wanted to showcase the potential of using connected objects to tell stories on the Internet today. I need a pair of these shoes! Forget Google Glass; the tech giant is in the footwear business now. Or at least it was at the SXSW series of film, interactive, and music festivals in Austin on Monday. Together with Adidas, the technology giant unveiled its concept "Talking Shoe," a smart sneaker designed to get people off the couch and exercising. But Google didn't just see fit to give the shoe the usual moving parts (an accelerometer, a gyroscope, a pressure sensor, Bluetooth connectivity). The sneaker also boasts a personality, one that is alternatively cheering and jeering depending on your level of activity.